This page is a celebration of 1920s Cars, full of gorgeous images, video and information. 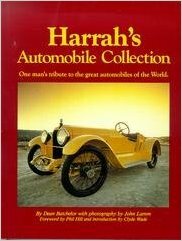 Watch the video first and then read a history of 1920s vehicles. 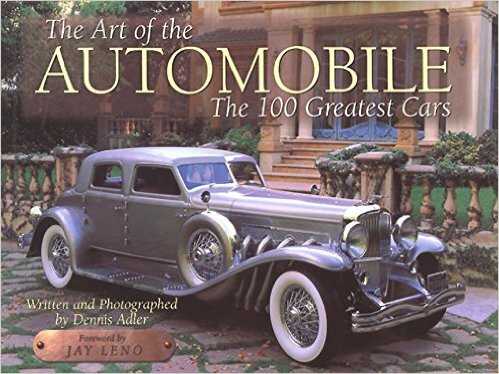 Automobiles were originally a plaything for the rich, and in the 1920s cars were built that would become classics of Art Deco Automobile design. Motoring was becoming a little more affordable for everyone though, and as early as 1908 Henry Ford introduced the first cheap motor car, a Model T Ford - or Tin Lizzie. It was ugly, noisy and bouncy, but worked on terrible roads. 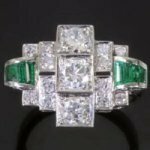 A million of them had been sold by 1915 for the princely sum of $525. Six years later by the early 1920s five million more cars had been sold. The model T gained a hard top in 1925 but were only produced in black. 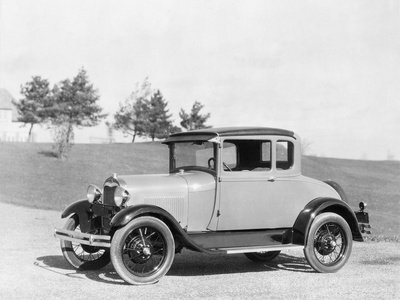 In 1927, the Model A Ford was brought out in 4 colours with windscreen wipers four-wheel brakes and a speedometer! Although Ford had the monopoly on cheap 1920s cars, especially in the USA and Australia, General Motors could offer a wide range of cars including the Buick, Cadillac, Oldsmobile, Pontiac, Chevrolet, Oakland and La Salle. In Britain W.R. Morris and Herbert Austin produced affordable cars after the 1st World War. One of the most well-known early cars was produced in 1922, the Austin Seven, also known as the Chummy or Bed Pan. It was a tiny open tourer which only seated 2 adults and had a top speed 38mph. 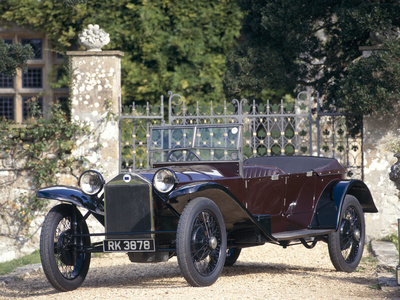 It was probably the most popular and affordable of the 1920s cars in Britain. Later on came the Austin Saloon which could take 3 children in the back, was closed in and more sophisticated. Its major competitor, the Morris Minor only cost 100 pounds. Austin Seven 1931 Swallow. Photo by Malcolm Asquith. At the same time the French were producing little Citroens and Peugeots. In Europe motoring was still only enjoyed by the moderately wealthy, with only 226 miles of new highway being constructed in Britain in the twenties. Petrol was bought in 2 gallon cans from the ironmonger, as roadside pumps were rare until well into the 1920s. 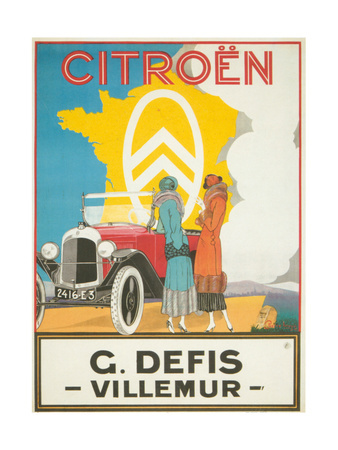 1920s Citroen Advertisement. Buy Posters Here. European manufacturers concentrated on the luxury end of the market and racing cars. There was a craze for speed and speed records were constantly being broken on land, sea and in the air. 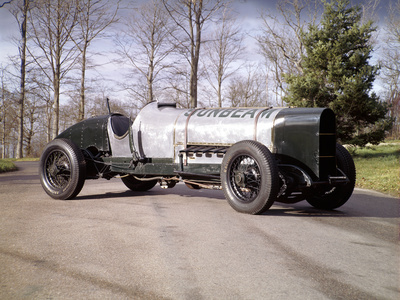 In 1924 Malcolm Campbell broke the world speed record in a Sunbeam at 146 mph at Brooklands. 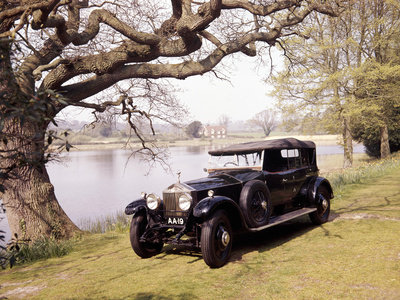 Top end cars in the 1920s were produced by Rolls-Royce, Bentley, Mercedes and Lancia. 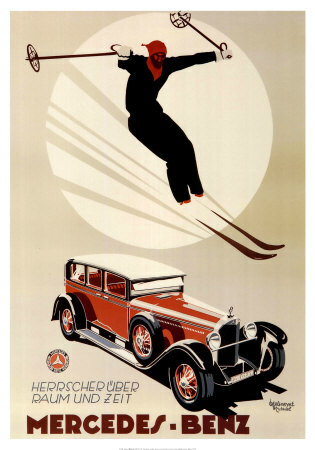 Motoring had taken off much earlier in the USA, with 620,000 miles of surfaced roads by the twenties. 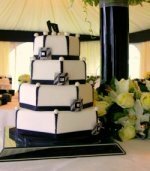 Most cars were still boxy, uncomfortable affairs, with the luggage strapped onto the back. But it was the luxury cars, and the racing cars which really captured the imagination. The very rich, those who had made their fortunes during World War I, wanted to show off their wealth, and how better to do that than with a fabulous luxury motor car. Many of these are now preserved in the Harrah Automobile Collection in Reno Nevada. An impressive collection of over 1000 automobiles representing the history of the development of the motor car. Only the 13th car in the Rolls Royce 40/50 range was silver - but the name stuck. 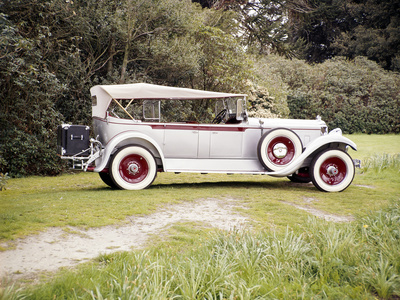 For a while the Silver Ghost was the best car in the world for those who could afford its supreme craftmanship and quality. Quiet and elegant, it was not built for speed, but for comfort and durability, of course, sporting the timeless Spirit of Ecstasy mascot. 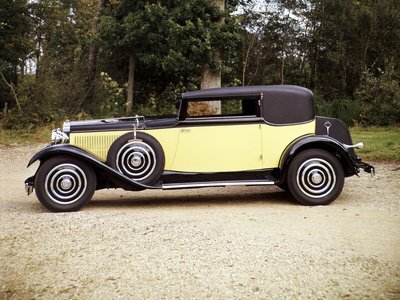 The successor to the Silver Ghost, the most stylish bodies for the Rolls-Royce Phantom I were produced in Springfield, Massachusetts. It was available in various different coach built bodies depending on customers' requirements. The Phantom II was introduced in 1929 although Phantom I was still being produced. The strongest challenge to Rolls-Royce's claim to producing the best car in the world came from Spain. One of the largest and most expensive motor cars ever produced at $42,000, only six were produced between 1927 and 1931. 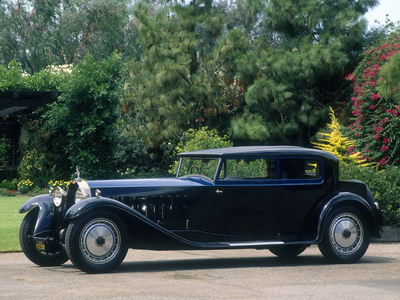 Famous for his racing cars, Ettore Bugatti wanted to prove he could rival Rolls-Royce at building an elegant town car. La Royale was 14 feet long, could cruise at 125mph and had real ivory on the dashboard and a trumpeting elephant mascot. The Sunbeam 3 litre sports tourer performed better than almost any other car on the road in the 1920s. 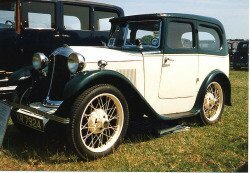 Sportier and more sophisticated than the Fords, Morris's and Austins which dominated the roads, it was originally developed as a racing car for the Grand Prix. 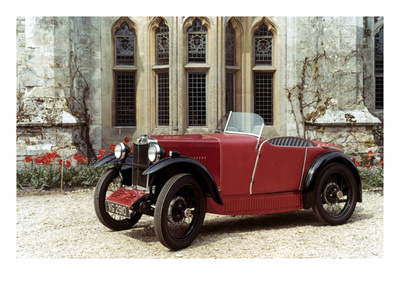 The first small affordable sports car, the MG M-Type Midget was based on the Morris Minor, with a version of the Wolseley engine, which Morris had taken over in 1928. Its lightweight fabric covered body allowed speed in spite of the small engine, and its angled windscreen and boat shaped rear gave it that desirable open-topped sporty look. The Lancia Lambda has the truly classic look of the 1920s tourer. Light enough to negotiate twisty country roads with comfort, it was an outstanding performer and beautiful too. It was technically advanced for its time, with four-wheel brakes and a unique one piece skeletal structure made of strong pressed steel. It rates as one of the great cars of the century. 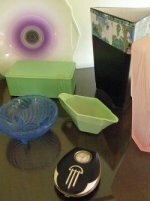 Scroll down for links to 1930s autos and other Art Deco transport. You may also enjoy my posters and prints pages from the navbar.